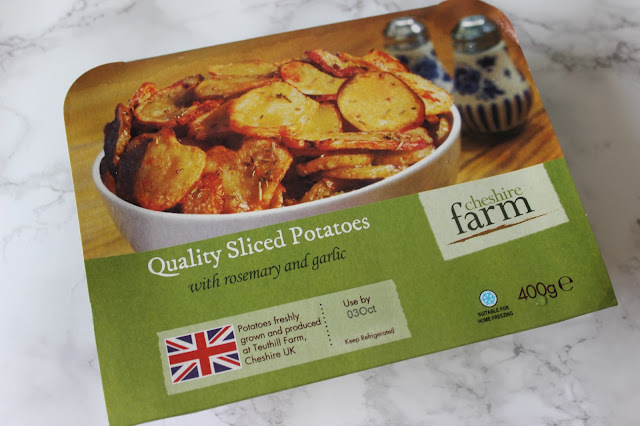 Cheshire farm is a family run business of course in Cheshire, selling a range of different high quality traditional chips. All of their products are additive free and suitable for freezing, so are perfect for quick teas when you don't have too much time on your hands. They are great because they go perfect with every meal and with there being 5 different varieties you can't really go wrong. The Quality hand cooked chips (which are award winning by the way!) are lovely chunky chips they were lovely and creamy inside which I loved. They were great quality and a great side for any meal, personally I loved them for dipping with BBQ sauce ! 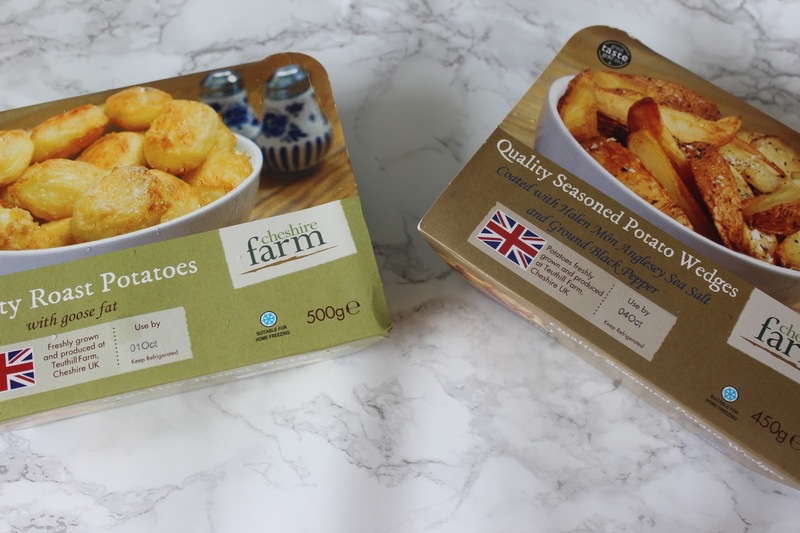 The Quality roast potatoes are perfect for a Sunday roast dinner. Cooked in goose fat they are lovely and fluffy inside yet nice and crispy on the outside. They were also really good sized potatoes and contained quite a lot in the box. I really enjoyed these. Next up is the Spicy Potato bites which are infused with Florida firepit spices. 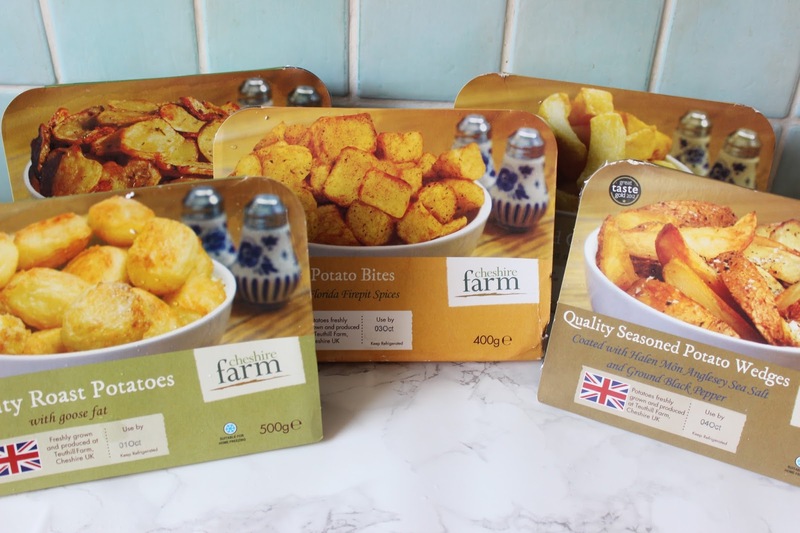 These are great for adding a little bit of flavour to a meal and add something different than your average potatoes. They weren't too spicy, they had just the right amount of flavour and were lovely as a side dish. Next has to be my favourite out of the five, the quality sliced potatoes with rosemary and garlic. I loved these, they are so nice, crispy and light and went perfect with fish. Lastly is the Quality potato wedges seasoned with the Anglesey sea salt and ground pepper adding the perfect seasoning, again these were great for throwing in the oven to go with a meal. These served two people as there were quite a lot in the pack and were lovely and chunky. 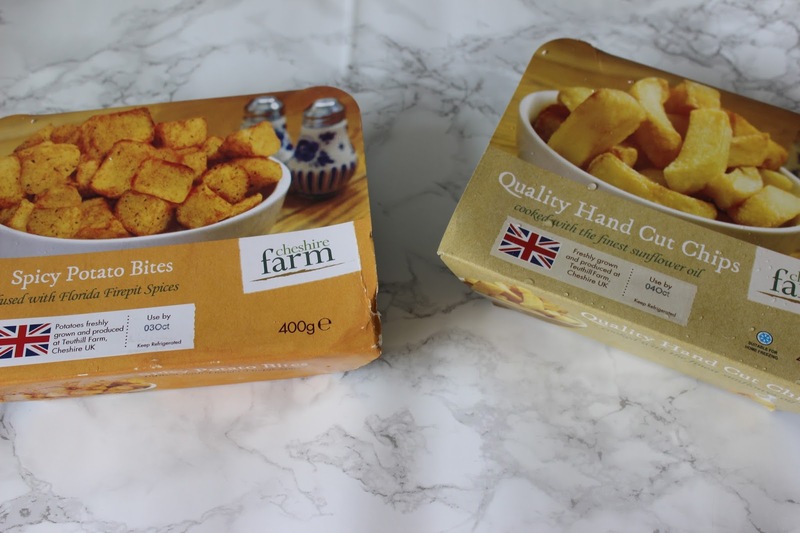 Overall I really enjoyed trying Cheshire farm's chips they were amazing quality, much better than supermarket bought chips. Its always great to buy products locally and support local towns rather than buying from well known brands. Priced at £2.50 a box these are pretty reasonable especially with the quality of the chips. They can be purchased in Waitrose, Spar, Booths and Blakemore.